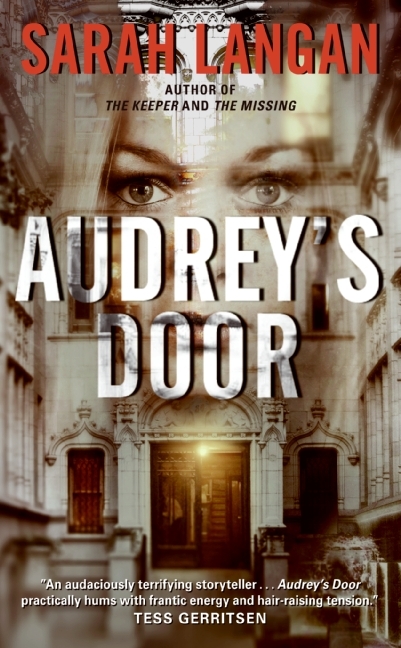 Congratulations to Sarah Langan on winning the Bram Stoker award for her novel Audrey’s Door ! by Robert Rodrigeuz is coming this summer. A sneak peak and trailer is now up. I recently had a chance to catch up with author Nick Kaufmann to talk about his upcoming book Chasing the Dragon. NK: So tell me about this blog of yours. DB: Remember I told you about it a few months ago, when Hunt at World’s End www.amazon.com/Hunt-at-Worlds-End-Gabriel/dp/0843962453/ came out and I wanted to interview you and ask you things like in a fight between Gabriel Hunt and Godzilla who would win? NK: Godzilla would win. Definitely. Gabriel Hunt is one tough hombre, but Godzilla’s sheer size gives him a distinct advantage. NK: The limited edition hardcover came out in January from ChiZine Publications, and was sold out in the preorders stage. The more affordably priced trade paper back is coming out in March. DB: Well despite my fascination with asking you to detail a Hunt versus Godzilla fight I actually have some real questions for you. I had just read my story The Water Dragon to a friend and I asked her if she thought the story was a genre story or a literary story. She replied well it has a dragon in it so it definitely is not horror. I instantly thought of Chasing the Dragon and said, funny Nick Kaufmann’s new book really puts that notion to the test. NK: I can understand where your friend is coming from. Dragons certainly are icons of fantasy, a common hallmark, if you will. And yes, most of the time dragons are associated with high fantasy or at least fantasy in general. But authors like Michael Moorcock have mixed a horror-like tone of dread and terror with other fantasy tropes, like Elves. I’m thinking about Elric here. Moorcock never explicitly calls the people of Melniboné Elves, but the iconography he uses for Elric’s people is very Elflike, especially in the way they’re presented as an ancient, magical, pre-human society and that their appearance is given as tall, lean, beautiful–the usual Elflike features one gets in many a high fantasy, which is what tipped me off that Moorcock was playing with tropes there. I love it when authors play with tropes, and it always feels fresh to me when they add a sense of dread to what is normally presented with a sense of wonder. DB: And you’ve done this with dragons in Chasing the Dragon. NK: It wasn’t my original intention. In an earlier conversation you mentioned to me that no one has ever used dragons in a horror story before, but I’m not sure if that’s true or not. To tell you the truth, I haven’t read enough stories with dragons in it to say. I really doubt I’m the first. DB: What about the trope of heroin users? The heroine in Chasing the Dragon is a heroin addict. NK: Funny, but drug users tend to be featured widely in crime novels, and less so in fantasy and horror–though I’m reminded that Elric of Melniboné was also a drug addict. The addicted hero is more often seen in police procedurals. Their journey is often one of redemption. I think we saw something like that in the first Lethal Weapon movie, though there Riggs’ addiction was suicidal tendency rather than the usual drugs or alcohol. DB: A movie that would be greatly improved with the addition of a dragon. Here’s a more generic question but one I’m interested in the answer to none-the-less. What was your inspiration for the story Chasing the Dragon. Was it a movie. A song. An idea bouncing around in your mind? NK: The inspiration came from a song by a band called Trivium that I like a lot. DB: What kind of music is it? DB: Death metal or one of the strange infinite subdivisions of such. NK: I’m not sure what to call them. Death metal maybe, though they’re not exactly that. They do use a lot of death metal’s weird cookie monster vocals, though. DB: Can I quote you on that? NK: Sure. Anyway, the Trivium song is called Becoming the Dragon. I was listening to the CD in the shower, which is where I tend to listen to most of my music, the shower and while I’m writing. I also tend to do my best thinking in the shower, for some reason. So the title of the song gave me the idea. The idea was for a high fantasy kind of story. A kingdom with no king is being plagued by a dragon. Whoever can kill the dragon becomes the king. But then the power that comes with being the king would corrupt this person and they begin turning into a dragon… or becoming the dragon. And so the cycle would perpetuate: power corrupting a hero into a villain over and over again. It was a political allegory. But I don’t write high fantasy nor do I particularly like writing about kingdoms, so the idea wasn’t quite right for me in that incarnation. 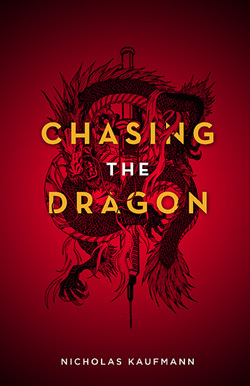 DB: How did it transform into Chasing the Dragon? NK: I don’t recall the exact transformation but at some point I decided that if I was going to shy away from writing a high fantasy, I might as well to retreat to my comfort zone, which is the horror genre. At that point, I knew I wanted to write a horror story that involved a dragon in a modern day setting. I also wanted it to be kind of a Western, like High Noon, where it’s one person against the Dragon. An unbeatable odds kind of thing. DB: How did the St. George aspect come into play? NK: I knew very little of Saint George so when I did a bit of research I was pleasantly surprised to discover how well it fit in to what I was doing. DB: At what point did you integrate it in? NK: That definitely happened organically, as I was writing the story. I knew there had to be a reason Georgia, our heroine, was chasing and fighting this real-life dragon, so I thought, why not make the reason something big? Like, cosmically big. And that’s when I started weaving the story together with the legend of St. George. DB: So it was one of those synchronicities that just worked. NK: Yes, it was one of those times where you just let go of the reins while writing and it worked out. In fact, the story expanded from St. George to include dragonslayers from mythologies all over the world. There is a dragon figure and a dragonslayer in just about every culture, and it all fit in perfectly with the larger scope of the story as it developed. DB: A very Joseph Campbell like notion. NK: It is wild how so many cultures, many of whom had no contact with each other, had many of the same mythological motifs. There’s a universality at play that’s absolutely stunning, the way these different cultures shared certain icons. Like dragons. DB: Let’s talk about blowing people up. Tell me about the Western angle. NK: Chasing the Dragon is a road trip story, but most of it is set in the dusty plains of the Southwest, in the town of Buckshot, New Mexico. Like a Western, especially a Spaghetti Western, there’s the lone hero and a lot of gun fighting, but I also consider the story an anti-Western in that instead of everything being new the way it was in the frontier, there’s a pervasive sense of decay, of things falling apart. DB: There is a real John Woo aspect to the fight scenes. NK: I’m a big fan of Woo’s Hong Kong heyday: The Killer, Hard Boiled, A Better Tomorrow. Woo has a real Western flavor to his films, only instead of lawmen and outlaws dueling it out in the middle of a frontier town he uses gangsters and cops in an urban setting. DB: Your writing in general always has a real cinematic feel to it. NK: Thanks. Like everyone else in the world, I love movies. I also love books, especially well written ones, but to my chagrin I sometimes think I’m more influenced by films than I am by books when I imagine the scenes I write for any given project. I mentioned High Noon before, and there are a lot of references to that movie in the story. In much the same way Gary Cooper’s character has to face the bad guys alone, Georgia has to face the Dragon alone, so naturally she identifies with that film in a resonant way. DB: Did you write Chasing the Dragon before or after your Gabriel Hunt novel? NK: I wrote Chasing the Dragon before I wrote Hunt at World’s End, though I don’t think it sold until after the Gabriel Hunt novel. Though they were two very different experiences, both books were a huge amount of fun to write. DB: How would Gabriel Hunt fare in a battle versus the Dragon? NK: Better than he would against Godzilla. At least for a little while. My short story Resolution 17 has received an honorable mention in Writers of the Future Contest. This is a nice bit of encouragement as this particular short story has had a rough ride. Years ago I entered into contract to make it an audiobook and went into production but the start up company never followed through. Yes a cautionary tale but onwards and upwards ! I’m looking forward to placing it at a new home and being able to share it with you soon.